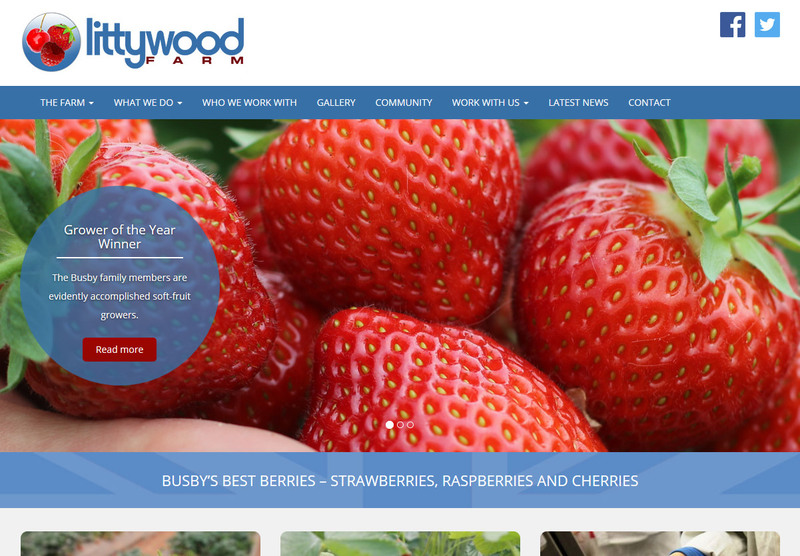 Local award winning, soft fruit growers, Littywood Farm approached Rapid Web Services to re-design their website to bring it up to date. Using their existing logo the brief was to give the website a more modern look, easy to navigate and to serve as a reference point for prospective employees and buyers alike. The client requested the website to be responsive across all devices and specified that they wanted to update the content on the website themselves. Once we had sat down with the client to discuss their needs, it became apparent that a CMS would be needed to allow the client to be able to update all necessary content on the website including a news area. The ideal solution for this would be WordPress with a little help from plugins that compliment the core setup to achieve the needs of the client. Littywood Farm required a website that complimented the colour scheme of their existing logo as well as a website that had a clarity of content and navigation. Rapid Web Services designed a predominantly white website with blues and greys that were complimentary to the colours of their logo. The website was to have a top navigation with sub menu links in the form of tabs displaying when clicking the top links. Rapid Web Services created a bespoke WordPress theme built on the Bootstrap framework to achieve the requirement that the website should work on desktop as well as mobile devices. Using Bootstrap allowed us to deploy the design quickly into ‘mobile-first’, responsive HTML templates. Once these templates were signed off we integrated them into a WordPress theme structure so we could then use WordPress as the website Content Management Solution. Once the theme was completed, we utilised a number of WordPress plugins to help achieve our objectives. To allow Littywood to be able to edit the website we needed more flexibility than the core edit functionality that WordPress offers. We utilised the excellent plugin, Advanced Custom Fields to allow Littywood to be able to edit the individual content areas of the website. Advanced Custom Fields is a great solution to be able to super charge the control over the areas of the website that need to be editable. One important component of the website that the client wanted control over was a multi step form for prospective employees to be able to fill in and submit to Littywood. To achieve this Rapid Web Services used Contact Form 7 Multi-Step Forms to allow us to break the form into logical stages whilst keeping editable control for the client. To help achieve optimisation and on page SEO we used Yoast SEO, EWWW Image optimiser and WP Super Cache. Utilising key modern web design building technologies such as Bootstrap and WordPress, Rapid Web Services have created a website for Littywood Farm that brings the online presence of the company up to date with a mobile friendly website whilst allow the client to be able to administrate all areas of their website.